This vampire tale bears some superficial commonalities with Underworld, but it is exponentially gorier, with a fraction of the logic. It was written and directed by Sion Sono, so look out. 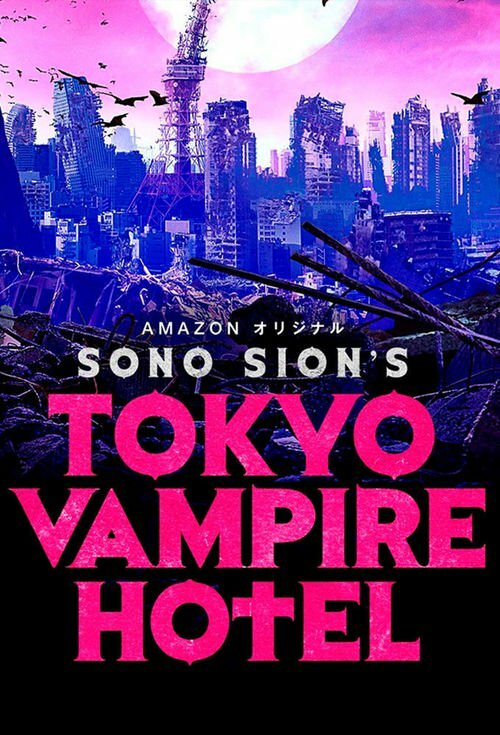 Humanity’s extinction is imminent, but the Dracula and Corvin vampire clans are still battling like its Y2K in Sion Sono’s feature-length edit of his television series, Tokyo Vampire Hotel (trailer here), which screened during the 2018 Fantasia International Film Festival. Manami is the last chosen one, who was born at a fateful hour and fed ultra-powerful vampire blood. She is supposed to be the difference maker, who will help the old world, crucifix-fearing Draculas overcome the crass, nihilistic Corvens, but she knows nothing about her true self or prophesized destiny. She thought she would be celebrating her twenty-second birthday with friends, but instead a heavily-armed vampire assassin arrives to massacre the entire restaurant, most definitely including Manami. “Fortunately,” K, a trusted Dracula enforcer, arrives in time to “save” Manami. Of course, it is probably safe to say neither clan really has her best interests at heart. Nevertheless, Manami’s lack off trust allows the Corvens to capture her, whisking the strange hybrid women off to their Japanese base of operations, the Hotel Requiem. It is a busy time in the undead hotel. The Corvens have lured a large assembly of shallow, entitled party people into their clutches, so their sexual couplings will help provide the vampires’ mojo after the impending Armageddon. Naturally, K will go in after her, with mucho bloodshed resulting. Arguably, Sono’s cobbled together feature edit is more coherent than its reputation suggests. The first half-hour exactly matched the opening of the series. Presumably, that is also true of the non-stop carnage of the final hour. Yes, the mid-section is a bit patchy, but everyone should be able to get the gist of it. One thing you can’t miss is the massive action chops and uber-femme fatale screen presence of Kaho [Indo] as the supernaturally formidable K. Holy cats dude, is she ever something. She is like Kim Ok-vin in The Villainess, but with a taste for blood. On the other hand, Ami Tomite is shockingly poignant as Manami, even when she is tearing Corvens limb-from-limb. Frankly, there is probably more blood per frame in TVH than in Sono’s Why Don’t You Play in Hell, which is really saying something. In some ways, the narrative echoes that of Bad Film, but Sono fully capitalizes on the bloody possibilities of vampirism. For the record, the film version is missing a rather clever bit from episode one, wherein all of Tokyo’s fortune-tellers start freaking out, because they foresee every one of their customers is doomed to die the next day. Still, Sono’s one hundred-forty-two-minute super-cut certainly does not shortchange viewers in the action and gore. After watching it, you know you’ve seen something, that’s for sure. Recommended for Sono fans who refuse to patronize Amazon, the feature version of Tokyo Vampire Hotel had its Quebec premiere at this year’s Fantasia.